be taller than she is. "I’ve been watching it grow for three to four years, and now it’s gone," Stone told Call 12 for Action. "It just made me sad." The tree was mistakenly removed by a local tree service Stone hired to trim a different tree and remove four shrubs. The company got rid of the shrubs months ago but left three of the stumps. "I asked her when they would be back out," Stone recalled. 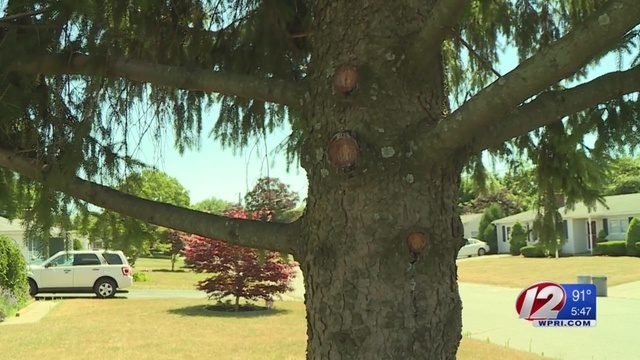 "[An employee of the tree service] said they completed the job and I said no, that they hadn't." Stone said she marked the stumps with red ribbons so when the crew returned, they would know exactly what to remove. But instead of grinding the stumps, the tree service cut down Stone's cedar tree, a small fir tree and another shrub. "I was pretty much hysterical," Stone said. Then Stone was double-billed for the work. The invoice totaled $900.